Making his only media appearance of the bye week, Florida Gators head coach Jim McElwain announced during Wednesday’s SEC teleconference that redshirt freshman walk-on kicker Jorge Powell will miss the remainder of the season with an undisclosed injury. Powell, who replaced redshirt junior Austin Hardin (hip flexor) and earned the trust of the coaching staff despite missing a couple field goals, started Saturday’s game at LSU but was unable to finish after suffering an apparent lower leg injury. Hardin came on to finish the game and did not miss a kick, but McElwain noted Wednesday that he is still dealing with his ailment. 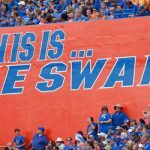 Though Hardin is expected to be able to play in two Saturdays against Georgia, McElwain did not definitively say he would play. With Hardin’s status in some doubt and the Gators now down a kicker, Florida put out an open casting call Monday for walk-ons. According to McElwain, 216 full-time students signed up for a tryout, though that number will be whittled down to those that could actually qualify and make the team. One such student who will try out is Brooks Abbott, who signed with Virginia Tech out of high school before transferring to Florida after his sophomore year. he spent 2014 with the Gators but was nowhere to be found on the 2015 roster. According to a school spokesman, Abbott decided to give up football. Former Florida walk-on Dallas Stubbs, a true senior, will also tryout for the team, according to The Gainesville Sun. “I’m heading out right now to go practice,” he told the paper. “I hope it works out. It’d be awesome to get another opportunity.” Stubbs was a member of the Gators in 2013 but did not return to the team the following season. Adam, any insight via your sources as to what is “truly going on” with Hardin? He has a very strong leg via kick-offs (don’t have the stats but most seem to be touch-backs) and has real game experience i.e. opponents trying to block him etc. I know at times we was not constant which is the last thing you want from a kicker, however the ongoing vagueness coach Mac has expressed with Hardin is quite odd. He suffered a hip injury but has been cleared to play. He doesn’t feel comfortable enough to get on the field though. He obviously did last week. time to bring in Clarabelle.